Throughout history, socio-political (or religious) oppression has fuelled some of the world’s most powerful cinema, with film used as mirror – or weapon. Stalinism’s spread ushered its pervasive proliferation in Soviet bloc countries and in Cuba, as state propaganda tool or – for filmmakers, subversive retort. Similarly, Chinese and Iranian cinemas were ignited onto global screens by resistance to state control mechanisms. While glasnost and perestroika temporarily diluted Russian cinema’s bite into special effects-driven B grade emulations of Hollywood, Putin’s tightening grip on power is spawning a re-emergence of Russian provocateur auteurs – foremost amongst them Andrey Zvyagintsev . His debut feature, The Return (2003), a critique of the country’s class disharmony, won Venice’s prestigious Golden Lion, marking the arrival of a prodigious talent. His following films – The Banishment (2007), and Elena ( 2011), a biblical parable of the disparity of life for rich and poor, gained international acclaim, while Leviathan (2014), with its more overtly critical indictment of the corruption of Russian officialdom prompted not only state disapproval but a tightening of political scrutiny, as relations between the country’s foreign Oscar nominee and the state cooled. His reputation cemented, and away from Moscow’s critical eyes with foreign funding. makes his current release, Loveless, a gripping, intense thriller, and less strident than its predecessor Leviathan. The film’s catalyst is the disappearance of a 12 year old boy, a disappearance unnoticed for two days by the boy’s toxically co-habiting, divorcing parents who, burdened by the presence of a child from their union, impatiently want to move in with their respective new lovers. The search takes us on a searing journey through Moscow’s underbelly, including hospitals and a morgue (no spoilers here! ), harrowing even for this tough couple, as the film exposes the plight of Moscow’s many street-kid fringe-dwellers in a city devoid of empathy and spirituality – and, for them, devoid of hope. To his own uniquely stylistic cinema, Zvyagintsev brings his poetic and painterly stamp , occasionally evocative of – though totally underivative — the chilling power of Michael Haneke, and, more specifically here, echoes of Ingmar Bergman’s Death of a Marriage. At the 2017 Cannes Film festival, Loveless was one of the highest critically-rated films. Strangely enough, directing wasn’t the Siberian-born director’s original artistic aspiration. As a youth he idolised American actor Al Pacino, but his acting career was abandoned a few years later due to disillusionment with the narrow scope of TV roles. By contrast, as a self-taught writer/director, (collaborating closely with script partner Oleg Negin and Director of Photography Mikhail Krichman) Zviyaginstev’s success was instant. His stylistically distinctive flair has even elicited comparisons to Russian masters Tarkovsky and Sokurov (particularly in his use of long takes). Although he drew the state’s ire with Leviathan, Zvyagintsev is reluctant to wear the mantle of dissident, opting to liken his role to a clown in a royal court, observing ,“the intelligent, wise king knows that jesters are needed – not only to entertain but as the only people to tell him the truth.” It’s a Shakespearian concept; like this precedent, Loveless depicts the story of familial – and by extension — state crisis. Antithetically, Alyosha’s parents’ ambitions veer along a radically different trajectory of aspirational upward mobility; Alyosha’s beautician mother, Zhenya (Maryana Spivak). is having an affair with an older affluent lover which augurs a more impressive future. On an outing with co-workers, the narcissistic toast “to Love and Selfies!” evokes the film’s values; ‘love’ here is driven by the pragmatism of lust – as suggested by the title’s echo : devoid of romance, tenderness, empathy. Alyosha’s disappearance and the subsequent search thus raises more questions than answers. In an indictment of both uncaring parents and the state, police coldly abrogate responsibility to an extremely well-functioning volunteer group, in some of the film’s rare positive moments, but which nonetheless reflect the scale of the problem. Zvyagintsev and his crew– in a poetic, painterly way – confront our sensibilities and senses. Using wide-screen spatial isolation, in prolonged long-shots and wipes of a lonely, cold cityscape, they reinforce the soulless solitude. As darkness pervades (the screen), Mayan allusions to apocalypse are heard on radio – reinforcing impending bleakness. Through tropes of industrial decay and synecdoche of stunted nature, alienation permeates the city’s soulless sterility as the search attempts to retrace the boy’s journey – in a family, city and society lacking a moral compass. One of my favourite reviewer/critics, Rolling Stone’s Peter Travers, brilliantly encapsulated the film’s metaphorical trajectory as :”This micro-focused approach allows the director to turn the story of family into an X-Ray of a nation’s bruised soul .“ The question, then, leaves us pondering the subsequent diagnosis. : Is it transcendence? Is it survival? Undoubtedly, the power of Loveless transcends the familial. This child’s disappearance symbolises not only dysfunctional family relations but the breakdown of bonds between citizen and state, with Alyosha – like the countless others the film depicts – represented as a victim of indifference . Yet, whilst Loveless is firmly embedded in Putin’s Moscow/Russia , it simultaneously evokes the existential bleakness of capitalism’s techno-narcissistic, globalised post-modern era. For non-Russian audiences it, too, acts as a parable of our times, ringing familiar echoes – and alarm bells. The film’s remarkable feat lies in its ability to work potently on a multiplicity of levels. Intensely gripping as a thriller tracing an unloved child’s disappearance, it can satisfy some audiences as such. 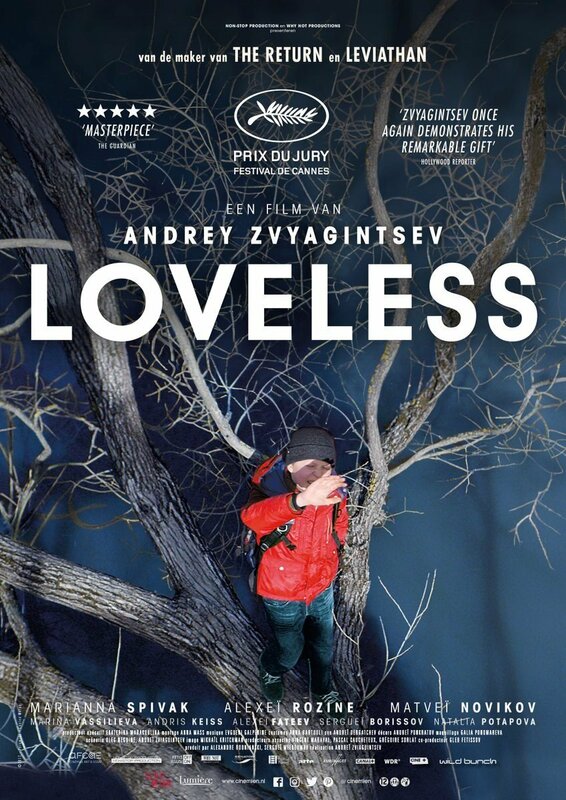 Yet simultaneously, Loveless harnesses the director’s full cinematic palette and cinematic armoury to depict an incisive critique of contemporary Moscow/Russia and for its victims – metaphysical, soulless bleakness..
During the release of the film’s predecessor, Leviathan, Zvyagintsev likened “living in Moscow to being in a minefield “. With Loveless, then, he has certainly detonated a cracker. Yet whilst Russia, and Moscow take centre-stage, the director’s sights are surely set on our era’s the universal myopic pursuit of self-interest . On this level, Loveless can simultaneously be viewed as a dystopian global indictment of our values, a parable/allegory of an era in which our moral compass is smashed. It’s a compelling, gripping journey – totally shaped by the viewer’s subjectivity; depending how low – and how far – one is prepared to go.